Tuesday, November 13, 12:30 to 1:30 p.m.
Join the members and leaders of the Student Civic Leadership Board for a community service project to assist the Buffalo City Mission with their efforts to serve 9,000 warm meals during the holidays. Come spend 10 minutes or an hour decorating the bags that will be filled with turkey, stuffing, mashed potatoes, and other holiday meal fixings. Coloring is also a great way to reduce your stress! Tuesday, November 13, 7:30 p.m. 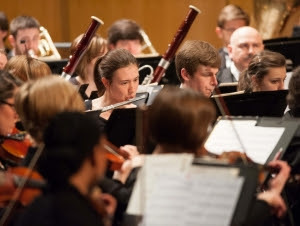 The Buffalo State Philharmonia Orchestra will perform under the direction of Dr. Thomas Witakowski. The concert is free and open to everyone. Wednesday, November 14, 11:00 a.m. to 1:30 p.m.
Stop by the Student Union and learn about how you can support and volunteer alongside one of Buffalo State's community partner organizations. Be a part of Buffalo State’s civic and community engagement mission. Learn how you can spend a week of your spring or summer break volunteering with other Buffalo State students as you dig deep into a social issue! Wednesday, November 14, 1:00 to 3:00 p.m.
Erie County Health Department will provide training on how to recognize and respond to an opioid overdose. For questions, contact Weigel Health Promotions at 878-4719 or 878-3786. Wednesday, November 14, 7:30 p.m.
Thursday, November 15, 11:00 a.m. to 1:30 p.m.
A black detective sets out to infiltrate the Colorado chapter of the Ku Klux Klan with the help of his Jewish colleague. In the midst of the 1970s Civil Rights movement, they risk their lives to obtain insider information on the violent organization. Directed by Spike Lee. Starring John David Washington, Adam Driver, Laura Harrier, Topher Grace, Jasper Pääkkönen. Rated R. Part of the USG Movie Series. Buffalo State students admitted free with Student ID, and $5 for the general public. Friday, November 16, 7:30 p.m.
Join us in the Ciminelli Recital Hall at Rockwell Hall for an evening of Beethoven, Bach, and Kabalevsky performed by Holly Zimmerman. Holly studies in the studio of Amy Glidden, and will be accompanied by Ivan Docenko. Reception to follow the performance. Admission is free. Doors open at 7:00 p.m.